Discover the creative side of coding with Ozobot. We’ve found a fun way to engage K–12 students in hands-on STEAM learning: Ozobot! Ozobot is STEAM made simple, and we’ve teamed up with them to give away an Evo Classroom Kit to one winner and an Evo Educator Entry Kit to five runners-up. This giveaway comes just at the right time. Whether you’re looking for a way to celebrate the Hour of Code™ or simply looking for a way to incorporate more STEAM learning into your curriculum, Ozobot is the way to go. Ozobot offers users two ways to code, online and offline. Students can begin coding screen free, with the stroke of a marker. It’s that easy! Or students can learn to visually program Ozobot with OzoBlockly. Ozobot offers not one but two ways to code. You can code screen free, with markers or stickers, or you can practice visual programming with OzoBlockly. Ozobot is STEAM made simple. You can use either one of Ozobot’s robots, Evo or Bit, with students in grades K–12. The lessons and training provided with Ozobot along its incredible certifications for educators make Ozobot stand out from the crowd! Not sure you’re ready for coding in the classroom? Don’t worry! You can teach yourself how to use Ozobot with your students in no time with EasyStart Educator Bot Camp. And once you’re ready, you can use any of the 150+ STEAM lessons for students K–12 in the Ozobot Lesson Library. What are you waiting for? Get your name in the entry mix now! No purchase necessary. Making a purchase will not increase your chances of winning. The promotion is open only to legal residents of the United States who at the time of entry are a) eighteen (18) years of age or older and b) currently employed full- or part-time as an educator by an accredited public or private K–12 school in the United States. WeAreTeachers is the official administrator of this program, and OZOBOT is the Sponsor. Employees of WeAreTeachers or the Sponsor and their affiliated companies, subsidiaries, distributors, sales representatives, agents, advertising and promotional agencies, and the immediate families and household members (parent, spouse, child or sibling) of each are not eligible to participate. The Promotion is subject to all applicable federal, state, and local laws and regulations. All entries must be submitted using the online form by 11:59 p.m. central standard time on January 3, 2019. Winners will be selected by random drawing and announced on the WeAreTeachers website by January 10, 2019. 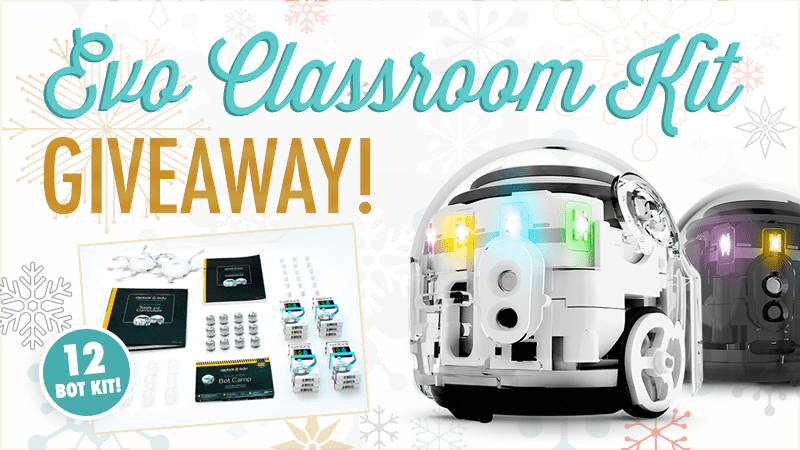 Prizing: One (1) Grand Prize Winner receives an EVO CLASSROOM KIT (12 robots) plus $25 Ozobot gift certificate, t-shirt, slap bracelet, and sunglasses – total value $1250; and five (5) runners up each receive an EVO Educator Entry Kit – a total value $82.50 each.